Chiba prefecture is no ravine not much. 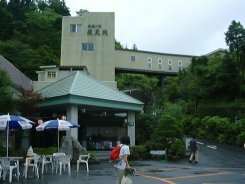 Yoro ravine is one of a few ravines, and is a tourist resort in Chiba prefecture. Takimien is near the waterfall of the Kurimata in the upstream of Yoro ravine. Although it is a splendid hotel here, it is "a secret hot spring hotel." A day's trip bathing visitor also accepts. When rebuilding the hotel in Showa 57, the fossil was found by groundwork. From this, the master of a hotel bowled in quest of ancient water. The hot spring came out at last. In Takimien, the main bathroom is called "fossil bath." The open-air bath is situated in heights, and a view is good there. There is a roof made from the log and atmosphere is also good. Hot water is made a little hotter. 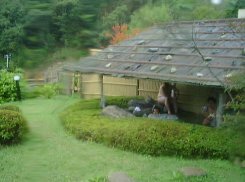 The hot spring of the Chiba prefecture has much water of black brown. However, it is clear here. A main bath is widely clean and its view is good also here. A dining-room is also near a front. A charge is higher. After walking along the Yoro ravine, we took the bath here. We were very pleasant. Get down by Ichihara IC of an Higasi-Kanto express- way, and go the national highway of No. 297 south. Go in Ushiku into the prefectural-road of No. 170, and pass over Yoro ravine. Furthermore, progress toward the upstream. Takimien is situated in the waterfall entrance of Kurimata. A car parking space is a charge. The hot spring visitor is 2 hour no charge. Yoro ravine is a small ravine which exists in the center of Boso peninsula. Green is rich, and since there are many waterfalls, it is one of the sight-seeing points of Chiba. 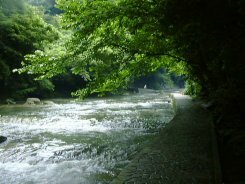 Since the lower stream of a river of the Yoro ravine is a tourist resort, it is noisy. The upstream is still quiet. 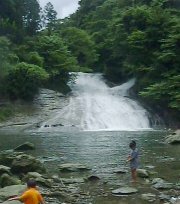 Since it was the rainy season, the waterfall of Kurimata has much amount of water. The intense flow of water is a wonderful view. There is a path for getting down from the observatory of a waterfall to a ravine. It was ruined with rain. "Many leechs are, frogs are huge, many crabs are also, and it is an uncanny place. 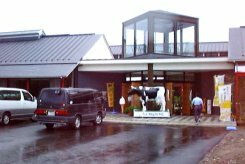 Although it was somewhat far from the Yoro ravine, we went to the Ootaki-cho friendship center. The specialty is sold there. The specialties of the Ootaki-cho are bamboo shoots and shiitake mushroom. They are cheap.